This is the view of Antigua from our rooftop in the afternoon when it’s probably going to rain and visibility is poor, it was taken on the first day we got into Guatemala. Hey everyone! 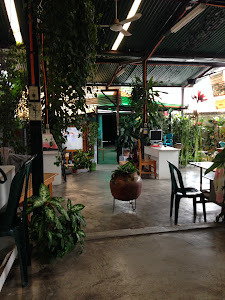 I am now in Guatemala, beginning to learn Español as best as I can. 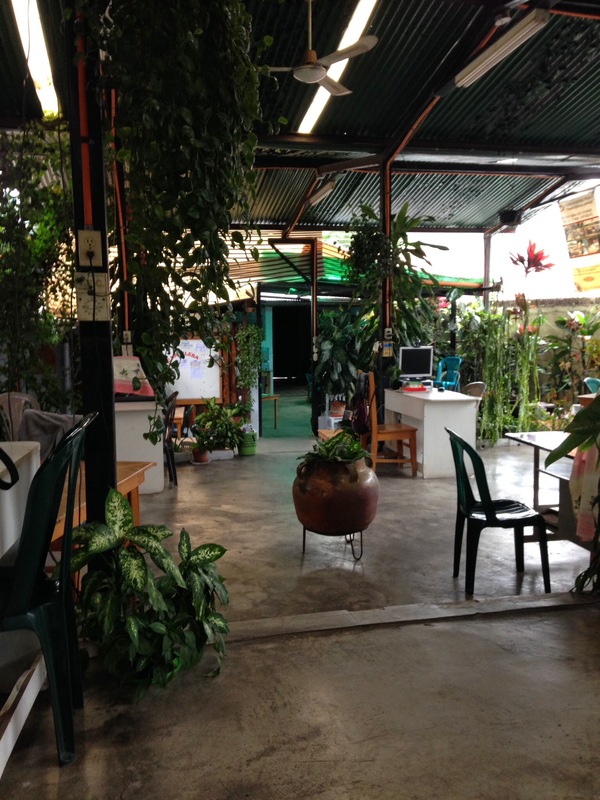 We are 1 week into our 8 week program at a language school called Probigua in Antigua, Guatemala. This place is a whole different world! (por supuesto). I was expecting a drastic change in culture from the USA, so my transition to life in Central America is going extremely well. As long as I am able to just go with the flow everything happens smoothly and I am able to not get stressed out. We flew out of Denver on Sunday June 22 to Guatemala City. I was surprised at how relaxed I was about the whole process. I knew that we would land and someone would be there waiting for us with our names on a sign. That was all I knew, and I was okay with that. I knew God would take care of me and so I let things happen as they would. Everything went very smoothly and we were picked up and we drove out of Guatemala City to Antigua and were dropped off at our host family’s house. Our host family is great, a single mom (dad passed away) with 3 children (a teenager boy, and 2 girls ages 12 and 10). Her grandpa lives here too and other family members live very close by. I get my own bedroom and Deacon Augustine (another seminarian from Wyoming) has his own bedreem and we share a bathroom. We basically have the top level of their house to ourselves. Their house is organized differently from houses in the USA. My bedroom opens onto the rooftop (it is an outside door), and Deacon Augustine has the same setup. The first floor has a small kitchen, dining room, living room, and other bedrooms and a bathroom. I was impressed by the beauty of the land in Guatemala. We are in a valley surrounded by montains and the weather is vastly different from Wyoming. It rains almost everyday here. Out of the 6 days we’ve been here so far, only one day was without rain. The seasons are backwards to what I’m used to. The locals call this winter even though we are still north of the equator (we are in the rainy season). It’s a good thing I brought an umbrella…it’s definitely getting used! The morning after we got here I was blown away by the view I got when I stepped outside and looked south. 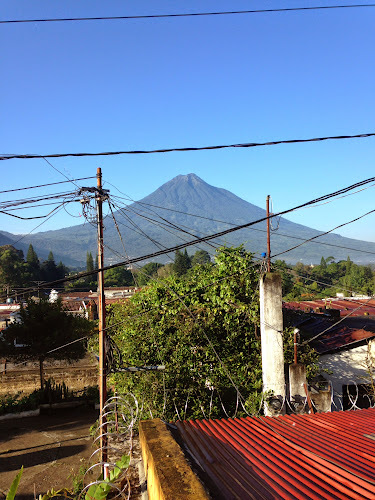 Guatemala has volcanoes! Antigua has 4 volcanoes nearby and a huge one directly south of town that overlooks the city. This particular volcano is called: “Volcan de Agua.” It is called the Volcano of Water because it is an inactive volcano and a long time ago the crater at the top of the volcano filled with water because of rain and overflowed down the mountain destroying the nearby towns. 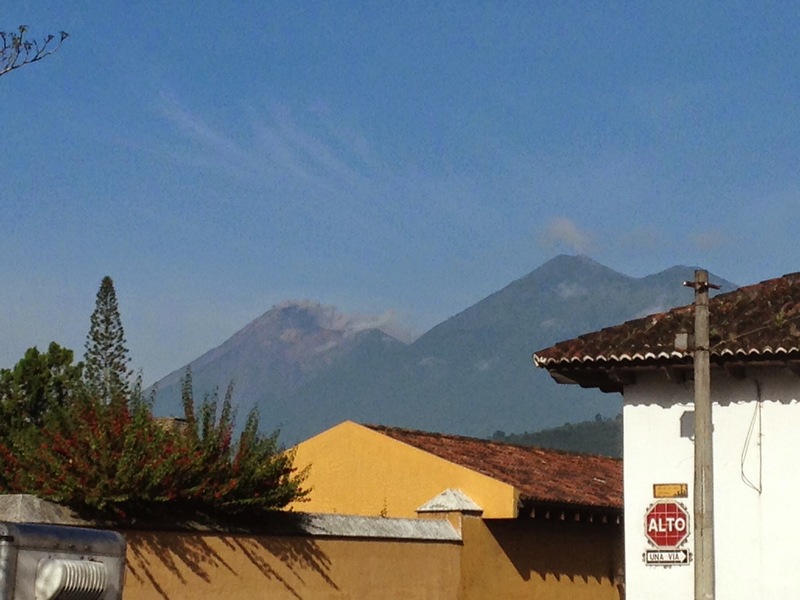 Volcán de Agua from our rooftop. A typical day for me here in Antigua consists of breakfast at 7am, classes from 8am to 10am then a thirty minute break (which is nice for grabbing coffee or tea) and then class again until 12pm. Lunch is at 1pm back at our host family’s house (about a 15 minute walk). 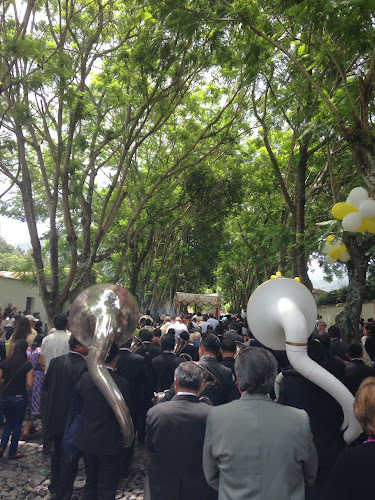 In the afternoon I have class from 2pm to 4pm and Mass is at 5pm (at La Merced). I am hoping to go to the gym every day after Mass before supper which is back at our house at 7:30pm. Then it’s homework and study and bed. My days during the week are very full. Class for me is one-on-one learning with a tutor. My teacher and I sit and talk completely in Spanish the whole time. She knows only a little English so occasionally we look up words in a Spanish-English dictionary. She is teaching me the grammar of Spanish and a whole lot of vocabulary words (I’ve got quite a bit of memorization to do!). I find I am remarkably better at understanding Spanish that I thought I would be. I can understand my teacher fairly well (of course she is using a much simplier vocabulary) and am able to communicate many things that I didn’t think I could. I am growing in confidence and with 7 more weeks of this I hope I will improve a lot. A typical lunch: Carne de vaca, frijoles, potato, nachos, y tortillas. I also find that I love the food here in Guatemala. I have always liked Mexican food and the food here is very similar. Typically for breakfast we get lots of fruit (bananas, apples, mangos, and papayas) and sometimes eggs or toast or cereal. We also get orange juice and instant coffee. I am definitely not used to instant coffee. Lunch is usually the biggest meal of the day and includes meat, potatoes, refried beans, and (my favorite) corn tortillas! 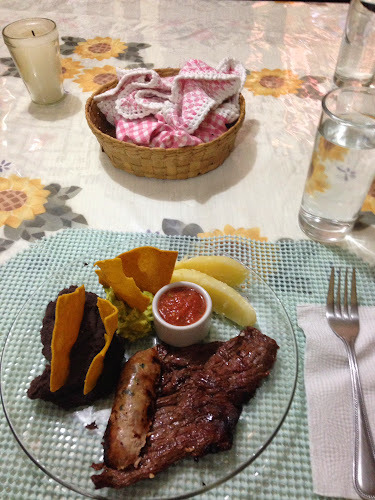 Supper is a lighter meal and so far has been soups with pan dulce (sweet bread). The food here is much healthier than typical meals in the USA. Our house mom doesn’t prepare anything that has been processed, everything is fresh. The fruit especially is extremely fresh and local. And it is all delicous! Is it bad that I really look forward to every meal? 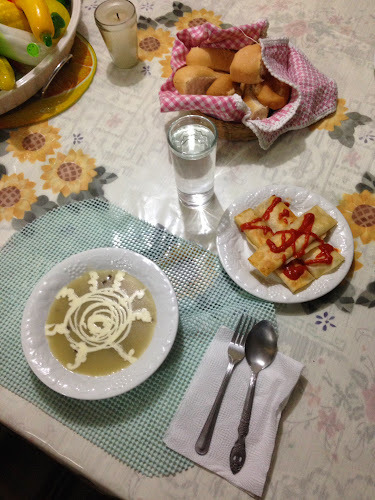 A typical supper: mushroom soup (with cheese sauce) and pan dulce. Volcán de Fuego was smoking one morning as we walked to school. This first weekend we stayed in Antigua and did a bit of exploring around the city. It is a small touristy city so there are a lot of things to see and shops to visit (there is even a McDonald’s). Also, this Sunday is the Solemnity of Sts. Peter and Paul, but in Guatemala each Church takes a Sunday throughout the months of mid-June to mid-August to celebrate the Solemnity of Corpus Christi in a grand way. 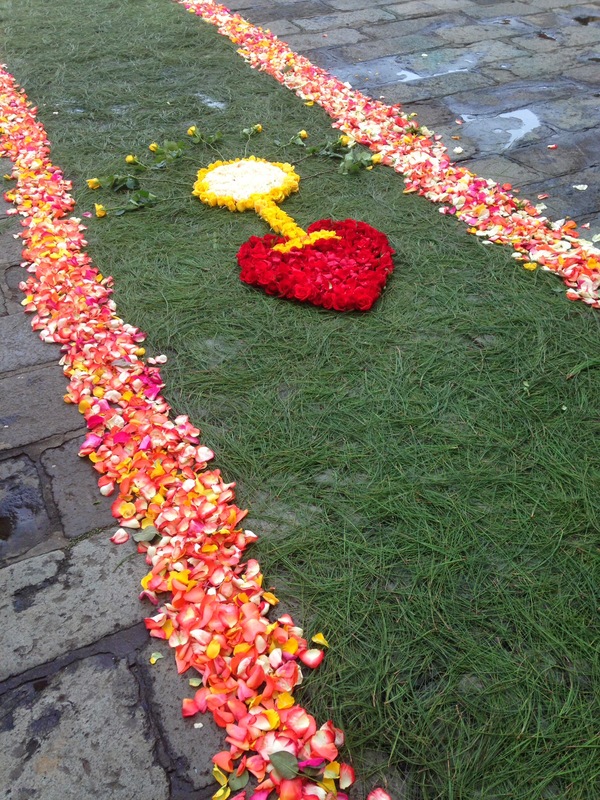 So we went to Mass at La Mercad where they were celebrating Corpus Christi this Sunday and that meant fireworks outside the Church as Mass began and a Eucharistic procession after Mass throughout the streets of Antigua. The people covered parts of the streets with flowers and leaves for Jesus. The procession was a few kilometers and took a number of hours to complete and there were fireworks practically at every part along the way and a marching band too. It’s definitely a vastly different experience than what we experience in the United States. 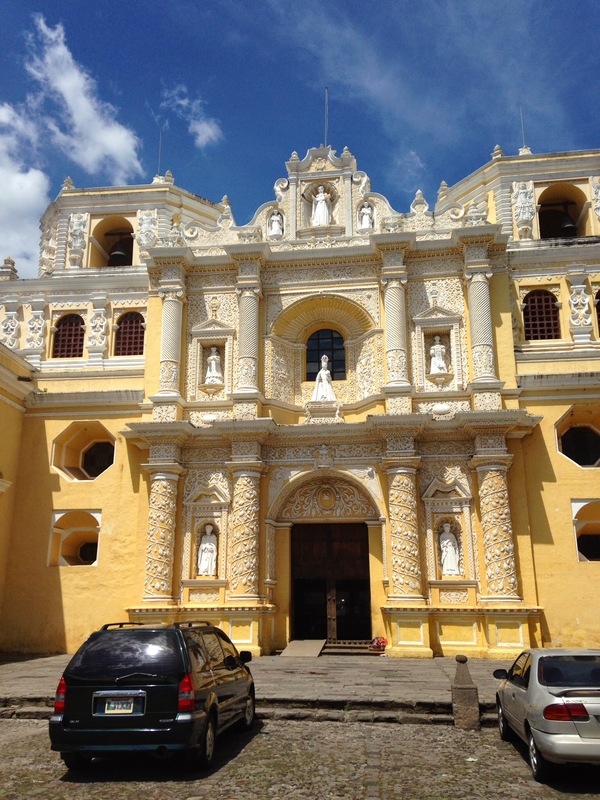 In future weekends we plan on getting out of Antigua and seeing Guatemala as a whole. 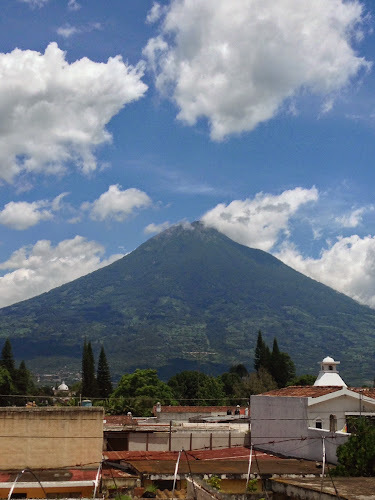 We want to visit Lago de Atitlán (Lake Atitlán) one weekend, go see the Mayan Ruins at Tikal (northern Guatemala) another weekend, and also climb a volcano (Volcán de Pacaya most likely). 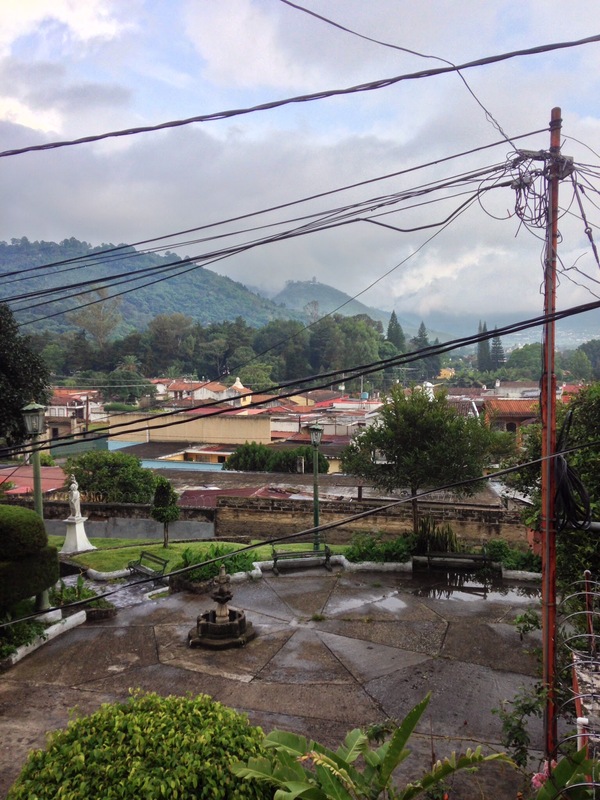 This summer is going to be a great way to see and live in this amazing culture in Guatemala, learn the language, and keep growing ever closer to God, our Heavenly Father, as I am constantly reminded to place all my trust in His most Sacred Heart. Keep praying for us down here and know of my prayers for you all and that I miss you!